The launch of a new website to promote the vital role of school libraries marks the latest collaboration between Onlineability and librarians’ professional body CILIP. Last year we created a site to mark the first UK-wide National Libraries Day. This year, during the autumn, we have been working once again with CILIP to help promote its Shoutabout campaign by designing and building its new website. Shoutabout aims to raise awareness of the value of school libraries at primary and secondary school level. It seeks to do this by persuading key stakeholders including government, head teachers, school governors and parents. An effective web presence is a key part of a campaign like this and we are very pleased and proud to have been involved in creating it. 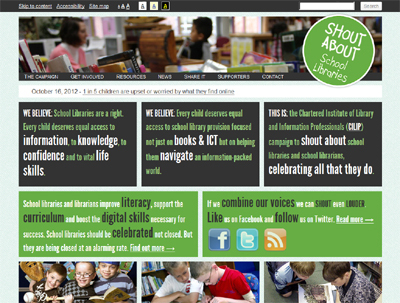 Launched by CILIP in partnership with the School Libraries Association (SLA) and Association of Senior Children’s and Librarians (ASCEL), Shoutabout was born of the belief that here’s never been a more important time to promote the importance of school libraries, librarians and support services. It reflects the fight to ensure children and young people across the country have access to proper library resources whether on-site, as part of a cluster of schools or through local authorities’ school library services. The campaign leaders are stressing how school librarians and Schools Library Services expertise are essential in helping children navigate the digital world and improve information literacy skills. They ask what use is a classroom of PCs connected to the internet if children don’t know how to use them effectively? Shoutabout is also campaigning for the inclusion of secondary school libraries in England in Ofsted inspections and wants to expand the coverage of local authority school library services that support individual schools, their staff and pupils. On Monday October 29, authors, teachers, librarians, parents and students from across the country marched on parliament to lobby their MPs in support of school libraries – and more events are planned. To add your voice to the campaign, visit the website here. Filed under Things we've done and tagged with campaign websites, cilip, Shoutabout, WordPress.